Scientists at the John Innes Centre have discovered a key "twist" in a Rubik's cube-like plant puzzle, which could pave the way to new, or more effective pharmaceuticals. Several members and derivatives of a group of natural plant compounds called heteroyohimbines, are, or have potential to be, important in medicine. One called ajmalicine, for example, is used as a treatment for high blood pressure, and the oxidised alstonine shows promise as an anti-psychotic drug. Piecing together the puzzle of how these compounds are made in plants could have enormous potential for developing new and improved therapies. But the heteroyohimbine puzzle is not a simple jigsaw in which the picture becomes clearer with each new piece discovered; it's more like a Rubik's cube. New research, published in Nature Communications by researchers working in Professor Sarah O'Connor's laboratory at the John Innes Centre, reveals a crucial "twist" in the puzzle that could make the rest easier to solve. "The small group of heteroyohimbines are all stereoisomers of each other, that is, they all have the same molecular formula, but they differ in the way their atoms are arranged - just like a Rubik's cube has the same number of coloured squares, but the way you twist the cube gives different patterns. Different stereoisomers have different biological activities, so we have been trying to understand how those different conformations arise, and why." In previous work the research team showed that an enzyme called THAS is involved in taking a precursor molecule called strictosidine aglycone (SA) and converting it into the heteroyohimbine molecule tetrahydroalstonine. However, it was not known how or why the different stereoisomers formed. 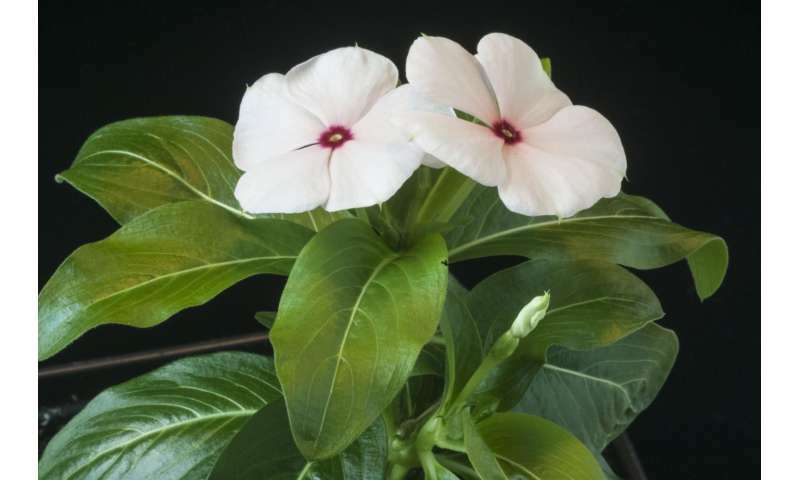 As a starting point, the group explored the transcriptome of the flowering plant Catharanthus roseus (Madagascar Periwinkle), a known source of tetrahydroalstonine, and found 14 candidate enzymes with very similar sequences to THAS. The scientists then expressed each of these enzymes in a different bacterial colony 'fed' with SA, and compared them to see which heteroyohimbines were produced. Heteroyohimbine compounds were produced in four of the 14 experiments. In three of these, production of the heteryohimbines tetrahydroalstonine and mayumbine was very similar: a ratio of 85:15. The fourth enzyme, called HYS, gave a completely different production profile of ajmalicine, tetrahydroalstonine and mayumbine in a ratio of 55:27:15. "Each of our four candidate enzymes had very similar structures, and each was given the same substrate to start with. But, one of them produced different heteroyohimbines in different amounts - why? By resolving the crystal structures of these four enzymes, we determined what was different about HYS, and found that a particular loop of amino acid sequence is important in producing these different stereoisomers." Conversion of SA into different heteroyohimbines seems to be a critical 'branching point' - after this, derivative 'scaffolds' can be further altered by other enzymes to produce a whole suite of alkaloid products with potentially useful and valuable properties. The discovery of HYS, along with systems recently developed at the John Innes Centre to produce plant compounds in large quantities, means we might be able to not only solve this Rubik's cube-like puzzle, but perhaps engineer improved or completely new compounds for use in medicine.